The Extra Magic Hour offered at Disney World Parks seems like a great opportunity to tour the parks without the crowds. The Mature Mouse™ has not had an opportunity to enter a park early, or stay late. I’m planning on taking advantage of the extra hour(s) during my next trip. I especially want to experience the Magic Kingdom after normal hours. What about you? Have you used extra hours offered to guest staying on property? Or, do you stay away from the parks on those days extra hours are offered? I would love to hear from you. 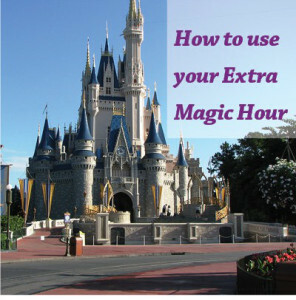 Your “Extra Magic Hour” at Disney World is your admission into a designated theme park one hour before it opens to the public or up to two hours after a park closes to the public. How do you get this privilege? Easy – you simply stay on Disney property, the Hilton by Downtown Disney, or Shades of Green Resort.